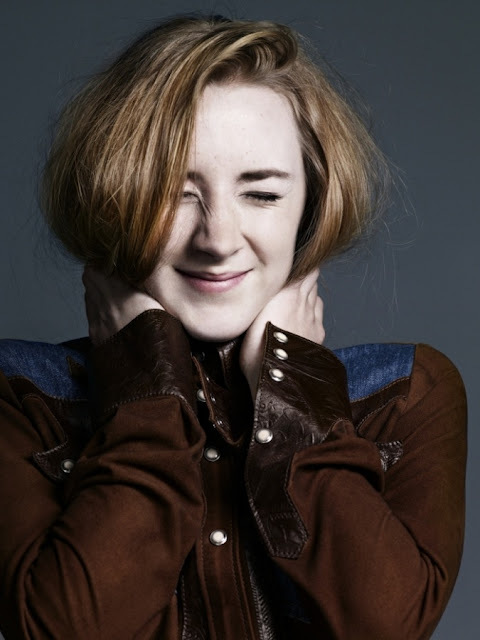 Saoirse Ronan is a young actress who has been in movies like Atonement, City of Embers, and The Lovely Bones. She is also in the new movie HANNA. AL: How are you doing? Saoirse: I’m good. I am enjoying the sunshine. Before we go back to Ireland. When we got here at first it was freezing. Then the sun came out a few days ago. It was great. AL: Do you live in Dublin? Saoirse: No. We are about an hour from Dublin. We are in a separate county. It’s County Carlow. AL: Did you always plan to become an actor, or was it an accident? Saoirse: I suppose it might have been an accident. It wasn’t necessarily something I wanted to do or a dream of mine. It wasn’t anything like that. I started film acting when I was eleven. I did some things when I was eight. At that time I wasn’t thinking about it as a career. My dad was an actor. I did some short films with him and it was lots of fun. I have kept on doing it. The more I do the more I love it. AL: Did you ever think about taking some acting classes? Saoirse: I don’t think so. I am taking acting classes twice a year when I do the movies. It’s a four-month acting class that is an experience in itself. I would love to go to college. I wouldn’t want to miss out on that. AL: I wasn’t saying that you need classes. I was thinking of actors like Brooke Shields and Jodi Foster who acted young, took four years off from college, and did great movies as an adult. Saoirse: Yeah. Definitely. Jodi Foster is someone who young actresses should definitely look up to. There are many people out there who are similar, like Natalie Portman. She went to college as well. It’s something that I would love to do. I am not sure if I would want to stop acting for four years. I would have to do films in the summer. AL: When did you take these pictures with Bryan Adams? Saoirse: It was two or three weeks ago in London. It was good fun actually. AL: Are you interested in fashion? Saoirse: Yes. I am interested in fashion as I become older. Like most teenagers, I like to look at Vogue and Elle. I like Zoo Magazine. I like all fashion magazines. I am in the public eye a little bit more, and I am nearly sixteen. I am experimenting with fashion a bit more. I am working with a stylist. It’s great. AL: Getting beyond the t-shirt and levis thing. Saoirse: I like doing that as well. I like to chill out. I like clothes that are comfortable to wear. AL: You did Atonement with Joe Wright. Are you looking forward to doing another film with him? Saoirse: Exactly. I am really excited to work with Joe again. We get on very well together. For us to come back together four years after we did Atonement is fantastic. We are doing something that is really different from what we have done before. AL: I see Atonement as a Keira Knightley vehicle. Do you feel that you stole the show a little bit? AL: I was thinking more in terms of acting awards. I think some people probably voted for you, and some voted for her. Saoirse: Oh yeah. I was nominated for best supporting actress, so we were never really in competition. AL: One of the narrative devices for Atonement is that the character of Briony has the same haircut all her life. All the three characters who play Briony have the same haircut. Did you think that was weird? And did you have to get rid of that haircut so people didn’t recognize you in the street? Saoirse: Yeah. People would come up to me and punch me in the face. No. It was a wig. So I didn’t have to worry about people recognizing me. They still did but they were shocked that I was nicer than Briony. It was an interesting choice to have that haircut because Briony, from that moment that she accused Robbie of the crime, is stuck in that moment in which she is atoning. She is stuck in the moment of that decision. I didn’t discuss this with the director, but that’s what I think is going on there. AL: I didn’t see City of Embers, but it made me think. Do you like doing films that are more fantasy, more in a science fiction world, or do you like realistic films? Saoirse: I like both really. I like films like City of Embers and The Lovely Bones were you have this special world as you said. The special effects guys come in and create this vision. You are not limited to what is on Earth. It’s great to do that stuff. But it is also great to do something that is a family drama. As an actress, you don’t want repetition and you don’t want to keep doing the same things. AL: With The Lovely Bones, what was it like to work with all these Hollywood veterans like Susan Sarandon and Stanley Tucci? Saoirse: I heard that giggle. It was fantastic. We were really lucky with the cast and the crew we had. We all got on extremely well. Luckily for Stanley and I, although we had some intense and sometimes uncomfortable scenes together, we were comfortable together, and we got along really well. We joked around. It made it very easy and relaxed for me to be in that kind of environment. I had a lot of people who were really good at their job, and who wanted to make the best possible film. So it was brilliant. AL: I think of Stanley Tucci as a funny guy and great comedic actor. He plays a bad guy, and he gets all the awards. Saoirse: Well, he deserves it. AL: Where did you film The Lovely Bones? Saoirse: We shot the first two months in Pennsylvania. All the exteriors. Then we went to New Zealand. It was six months all together. We shot on location and in Pete’s studio in Wellington. AL: What was it like to do all that blue screen acting where you are standing in a room, and all the background is added later? Saoirse: Yeah. Look at the blue. I mean, the moon. I didn’t mind it, to be honest. I thought it was going to be more difficult. Once you have imagination, and I think I do, and once you have good guidance from the people around you, and they know what they are doing, it’s very easy to react to something that is not there. When we were on set, Pete would talk to me and describe what was going on around me, even though it wasn’t there. He works like an actor, and there was music playing, and many things that we did during a scene. AL: You have also done this movie with Australian director Peter Weir. It called The Way Back. How was it to do a film with all these tough looking guys? Colin Farrell looks like he can rip someone’s head off. Saoirse: Have you seen any photos of it? Saoirse: He looks pretty tough in this actually. He had a big beard. It was fantastic to work on that film. We were in some rough locations like Morocco and Bulgaria. These places were different than any of our homes. There were two Romanians. They weren’t too far from where they lived, but for the rest of us: Jim Sturgess is from London. Colin lives all over. It was very new. I am pretty much the only girl in the film. There is an appearance of a few women in the film. I was the only girl stuck with a load of boys. AL: Is it comfortable when you are the only girl in a film? Saoirse: They all looked after me. They were all different ages as well. Ed Harris was like the dad. You feel like one of the boys after working with them for two months. AL: You are now doing another film with Joe Wright called Hanna, where you play an assassin. How is that going? Saoirse: Yeah. Very different. It will be good fun. I am training for it at the moment. We are going to film it in Europe and Morocco. I am looking forward to working with Joe again. It will be many people who worked on Atonement. It will be nice to be back with familiar people. AL: Do you have any favorite authors? Saoirse: I read a lot of books that are going to be made into movies. Things like The Lovely Bones and The Hobbit. I love anything really. There are some books that if they don’t catch my attention I find it difficult to go on. AL: Did you ever read any of James Joyce or William Butler Yeats? Saoirse: I did read a little bit of James Joyce. I read Dubliners. I love that book. AL: You have been to Academy Awards and BAFTA awards. Do you keep a lot of dresses? Saoirse: Sometimes. The problem with those dresses is that once you have worn a dress at the Oscars once you are probably not going to wear it again. AL: Do you do Twitter? Saoirse: Yeah. I do Twitter from time to time. For a while I was vaguely addicted to it. But now I have to pull back. I only write on Twitter now if I am going to a premiere. AL: I looked at your Twitter page. I saw that you followed some music people like Lily Allen. Saoirse: I like Lily Allen and Lady Gaga. I love Lady Gaga. I listen to modern music and some oldies. AL: Do you go to any concerts? Saoirse: I have been to a few concerts. I wanted to go to see Lady Gaga in Dublin. She is playing the same day as the Irish Film Awards. I was bummed that I couldn’t go. I have seen Fleetwood Mac. AL: Do you get recognized a lot? Saoirse: In Los Angeles, it is happening more. In Ireland, if people come over to you, they are very nice. You feel relaxed. I read in a magazine that Bono said he could walk down Grafton Street in Dublin and no one will approach him. That’s Bono. That is what our country is like. It’s the same in Los Angeles. People have their pride. Saoirse: Besides watching films, I learned to surf last summer. Saoirse: You find that funny? I am really quite good at it. I really like it. I was in rage this week in Los Angeles that I couldn’t go down and have a bit of a surf. There you go. I love swimming in a river.